Remember back when KFC introduced the "Double Down" sandwich? The one that posed the question, "Why do we even bother with bread? Let's just make a sandwich entirely of meat." 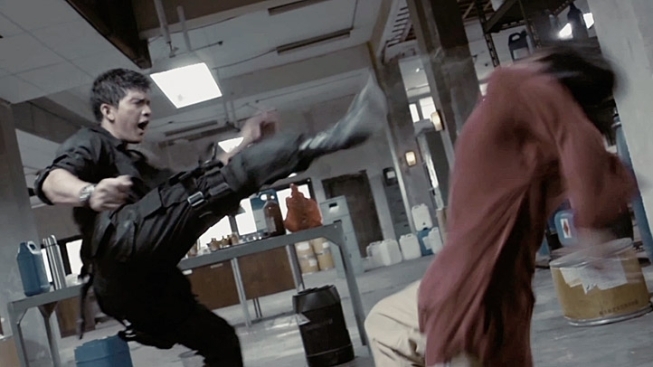 Well, "The Raid" is like the movie equivalent: "Let's just make a movie out of a two-hour action sequence." "The Raid" (sorry, "The Raid: Redemption" - apparently you can't import a film into America without giving it a meaningless subtitle. Yanks get nervous if they don't see colons) gives you a brief moment of set-up before lighting the fuse and letting everything go to hell. Whatever information you need, you get while running full speed, as this movie is a marvel of sustained pace and pressure. Here's the premise: An apartment complex in the Indonesian city of Jakarta is populated almost entirely by criminals and lorded over by a vile crime boss. The police attempt to move in and take the complex by force. That's it. What follows is a brutal floor-by-floor assault involving guns, machetes, knives, improv'd explosives, and some of the most brutal, bone-snapping martial arts you've ever seen. And it's kinda awesome. The sequences build from WTF to OMG so quickly, you can barely keep up, and some of the more imaginative kills (and there are A LOT) were impressive enough to earn appreciative cheers from the audience we saw it with. Sure, "The Raid" often deals in kung-fu movie reality (combatants walk away from blows that would leave the average human in a vegetative state on the floor) and some of the computer-assistance shows its budgetary constraints, but none of it takes away from the sheer adrenaline rush of the movie. In one stand-out sequence, a bunch of cops get sealed up inside an apartment and decided to hack their way through the floor into the apartment below. They proceed to drop in on a room full of crooks while ANOTHER room full of crooks starts spilling through the hole above them. It's the kind of set piece you can't believe hasn't been done before. Even more surprising is that the director, Gareth Evans, is Welsh. Maybe we're narrow-minded, but we didn't imagine a British director delivering the kind of movie you'd expect from Tony Jaa. And speaking of Jaa ("Ong-bak"), we are officially rooting for "Raid" star Iko Uwais to be the next big thing in martial arts movies. The guy's got it. Oh, and if you are the type who fears subtitles, don't worry. Dialogue is, shall we say, sparse. Don't wait for the inevitable English remake (it just won't do it justice, there's no way) and dive in. You won't be disappointed.